One of the East Coast based Blues faces challenges in acquiring prospects and engaging members. With the rollout of Health Insurance Exchange, they are not equipped to identify, segment and target prospect. In addition, they had several issues in engaging members for better health management. 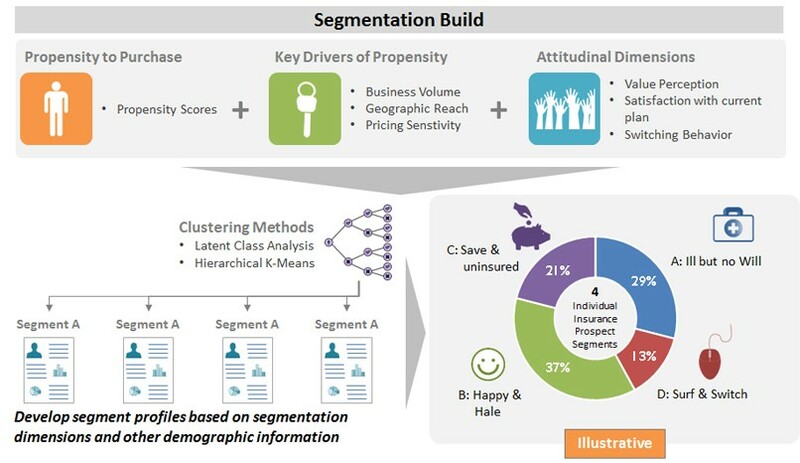 The insurer seeks a comprehensive member management process leveraging analytics. While the insurer has access to multiple data sources, data is poorly managed and not well integrated. Prospect data is siloed within the marketing team and not leveraged efficiently. We performed a detailed data mapping exercise to develop a robust healthcare analytics data model implemented in a common customer database. In addition, we partnered in developing analytical modules across different stages of the member lifecycle. We developed a comprehensive analytical plan covering various aspects of the customer journey including prospect segmentation and targeting, care management analytics and proactive customer engagement analytics. We developed prospect and member segments based on propensity models for predicting member response and purchase behavior. Data was gathered through primary market research, capturing attitudinal value perceptions of price, quality, experience, support and satisfaction with current plan. We helped our client with improved member targeting to increase fulfillment rate. An advanced analytics process identified members with high and low likelihood to complete health risk assessment. This provided the ability to proactively segment and target high likelihood members to improve completion rates. Our analysis results showed that the profile of members completing or likely to complete health risk assessment differed from the overall member profile. A care management engagement module was undertaken to understand care program engagement behavior, develop a likelihood to engage model and optimize targeting. Improved targeting resulted in 15-20% increase in engagement with the Cardiac care, Diabetes care and General care programs. By bringing together the member segmentation, care program engagement module and channel preference information, we established a scalable “Next Best Action” process to proactively engage members.